Current Downtown Condos For Sale in La Bellasara – Sarasota FL. Concierge, Heated Waterfront Pool Area, Hot Tub/Spa, Dock, Elevators, Fishing Pier, Fitness Room, Gated, Boat Slips, Handicapped Modified, Security, Water Access, Waterfront Luxury. Building Exterior, Cable, Community Pool, Escrow Reserves Fund, Fidelity Bond, Flood Insurance, Gas, Insurance Building, Manager, Pest Control, Public Insurance, Recreational Facilities, Roof, Security, Trash Removal, Water/Sewer. 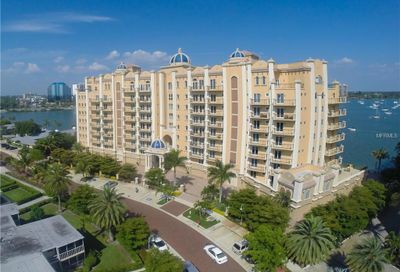 La Bellasara Condominiums in Sarasota, FL. 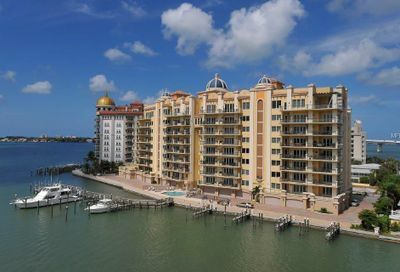 Located on prestigious Golden Gate Point in Sarasota, the La Bellasara gated condos boast 29 well-appointed units in four nine-story towers. A concierge is available to help you find the perfect restaurant or to reserve tickets to the show, and 24-hour security is always on hand when needed. There is a heated waterfront pool area as well as hot tub and dock, and the building, complete with elevators, has been handicapped modified to allow for ease of use for all members of the family. Built in 2006, La Bellasara is the ideal location for the avid fisher or boater, as water access is available via the dock and fishing pier, and boat slips can be reserved. The 455 feet of direct bay front guarantee beautiful views of downtown, Marina Jack, Sarasota Bay and the Gulf of Mexico beyond. The Mediterranean revival-styled building offers two-car garages, a fitness room, two-car garages, gathering room, media room, catering kitchen and board room. Looking for entertainment or a bite to eat? Main Street Sarasota is an easy drive away, offering multiple fine and casual dining choices for even the most discerning palette. Art galleries and boutiques line the easy-to-walk street, with a theater to top it off. The Sarasota beaches – Lido Key, Longboat Key and Siesta Key – are all within a half an hour drive from La Bellasara, where you can dip your toes in the sand and enjoy the view of the turquoise waters. La Bellasara is available for both home owners and those looking for a home away from home – being steps from the water and a few minutes from downtown Sarasota makes these condos an excellent choice for anyone.